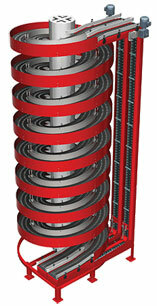 With dual track spiral conveyors, tracks operate independently within a single spiral tower. Tracks can raise or lower the load, and can optionally be reversible. A single drive motor is required for each track, resulting in substantial savings in energy, controls and systems integration. Since you can conveyor twice the load in the same footprint, the dual track systems require even less floor space than a single track spiral. Models with dual 8”, 12”, 16” or 20” wide slats are available. Some site assembly is required for models with 16” and 20” wide slats. 1200-200/1800-200 6'11" 5'11" 3'11" 8" 1'0"
1200-300/2000-300 7'11" 6'6" 3'11" 12" 1'4"
1300-400/2300-400 9'3" 7'7" 4'3" 16" 1'8"
1600-500/2800-500 11'2" 9'2" 5'3" 20" 2'0"
An innovative modular design allows easy customization and field modification to accommodate emerging needs. All spirals are made to order and are available in 4 basic configurations ( A, B, C and D), accommodating most requirements relating to the location of the in and out feed tangents. All configurations can operate up or down in a clockwise or counterclockwise rotation and custom configurations are available. The two tracks do not have to feed in and out of the spiral at the same elevations. 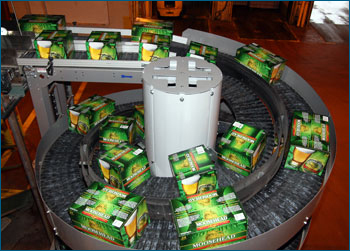 Most spirals are shipped without controls because they are normally integrated into an overall conveyor control system. Prewired missing slat detection sensors. Ryson Spirals are shop tested prior to shipment, but optimal performance depends on proper integration with the overall conveyor system.